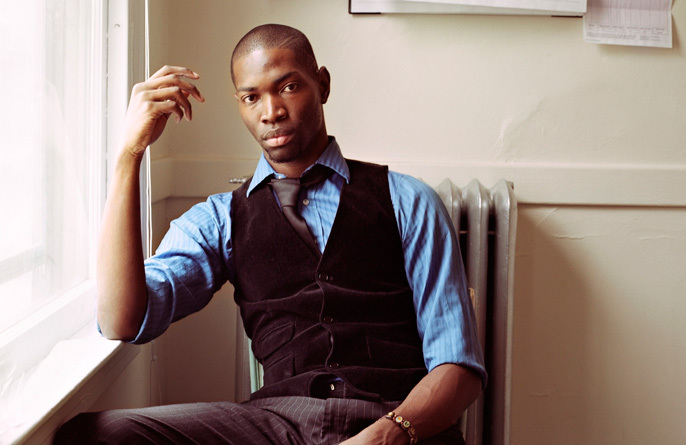 Karla Williams sat down, over tea, chips and a rather large spinach and bacon beef burger, to talk with Tarell Alvin McCraney, the animated and passionate playwright who can quote Shakespeare as if he were recalling childhood memories or his home address. It’s not often that you get to sit in the presence of greatness and young American playwright Tarell Alvin McCraney is just that. His first play The Brothers Size is being revived after a sell out run in 2007 by ATC and the Young Vic where his second play In the Red and Brown Water (the two plays are part of a collection of three called the brothers/sister plays) is also running. The Olivier nominated writer is also getting ready for his next production Wig Out! which is now on at the Royal Court Theatre, London. He has also just been named RSC/Warwick International Playwright in Residence where he has been commissioned to create a brand new piece of work to be produced by the Royal Shakespeare Company. The incredibly well-read and knowledgeable playwright attributes his inspirations to a variety of works including Sarah Kane, Federico García Lorca, Brecht and Peter Brook. However, he is the most enthused by the work of William Shakespeare and at just 28; he already aspires to run his own Shakespeare theatre production company. Shakespeare’s influence is very much evident in his work and his plays are full of imagery infused dialogue that packs vast amounts of emotion and depth into two or three lines. He truly understands the language and techniques of Shakespeare and the writer (who also writes in verse) is nothing short of a master playwright and pure genius. How did the residency at the RSC come about? Jeanie O’Hare, who is the literary manager there, contacted me about the opportunity, so I don’t know how they got my work – that would be a good question to ask Jeanie. She asked me what I wanted to do and what my influences were whether I wanted to take the RSC residency, after telling me what it was. I had some doubts about it because, as you can see, my schedule is kind of insane and I didn’t know how much time I could dedicate to them but some how, I don’t know how, we did it, [laughs. So you had an interest is Shakespeare before they rang? Always! I read Shakespeare often. There are these little things on your iPod now where you can read the text of Shakespeare, which I’m just ecstatic about. So I walk around reading Shakespeare. I studied it at theatre school, and as a playwright major we studied a lot of Shakespeare and I did a summer course at the British American Dramatic Academy studying Shakespeare with some people who used to work at the RSC like Andrew Wade. I love Shakespeare, always, always. You have to study it in high school and I went to a performing arts high school so we had to study it intensely, not just in an English course. Also for performance, a class and an acting class. I remember I learnt about four Shakespeare monologues for my auditions for undergraduate. I mean the language of Shakespeare; you can see it a lot in my work. I find that when you figure out technically what it is that you’re doing with the language and can see how the language is helping it become a tool. Any spell that a magician or a sorcerer casts the words and incantations, the incantations of the poetry brings up so much in just the words itself and then to add on top of that the actors own emotion and personality coming through is just – incredible. It’s like you can’t have [pause] a better tool. …is that the reason why you write in verse? Yes, because verse has a rhythm to it, it holds a meaning in itself. That's the other thing that Shakespeare does well. There is a rhythm to things, if you follow the rhythm of it; you follow when things are spoken in verse and when in prose. That for me is fascinating, not only fascinating its [long pause] it’s helpful. When coming to a play anything that can serve as a tool to help excavate the life of the play, the world of the play, is just…at the end of the day, who cares about the words on the page? At the end of the day what we’re trying to do is use those words the way they were written, how they were written, why they were written and which way to help excavate, help show us the world that which we are in. In Anthony and Cleopatra for example there’s that banter between Anthony and Cleopatra when she says ‘tell me how much you love me’ and he’s like ‘love that can be shown as beggary’…the verse is very strong and right on top of each other and then the next scene is Charmian and all the servants just talking about the stars and there’s languidness in it and repetition and looseness and it shows the tense and the conflict that exists between Anthony and Cleopatra. Anyway I go on and on about all of this because it’s important for me to establish that in that we get how much Anthony is trying to maintain this tense motion; this queen who is crazy, I mean she’s not crazy but she’s wild she has these emotions that fly so fast, he’s trying to maintain his love affair with her and be one of the third pillars of the world at the same time which keeps pressing on this love affair. Shakespeare shows you, in the language itself, how you can help rhythmically move a play along but also bring an audience in and help them follow a story. What kind of work can we expect from the residency? I have no earthy idea! [laughs] I think I might try and write a musical. And your other influences would be…? Every writer I read some way helps, from Sarah Kane to Chekhov, you learn something from everybody. I would be remiss and stupid to say only one thing influences my work, I think almost everything influences the work. Above all the one thing that influences everything is the performative nature of those things. Me reading Lorca is not as helpful as me performing Lorca or reading it in a performative way; reading it out loud is different from me then just reading it on a page. Doing Shakespeare helped me much more then reading it on the page ever did and so still to this day if I read Shakespeare, reading it out loud with my friends is just much more helpful then anything else. I didn’t come to playwriting from a writer’s stance, from a poetry stance; I came from the performative stance and was an actor first. So then why did you stop being an actor? Acting is hard; one of the reasons I stopped was because it was hard. The other reason I stopped was because there weren’t enough roles for a black actor I thought, not enough varied roles. I mean Shakespeare they do blind casting, but there were not roles specifically for actors of colour, there were roles, but they were just few and far between and it just annoyed me to death. So I was like ‘I’m going to keep creating roles for actors of colour so that we’ll have lots of stuff to do’. I figured I’d rather be trying to be a solution to the problem than adding to it by being one of the actors frustrated at not having a part. It’s also so competitive; you see your friend at the audition and you know its only two roles so you gotta beat each other to death for this one role – that’s not fun. You write ingeniously, from the way the characters in the different plays interlock so perfectly to the actors saying their own stage directions. Why do you do it? Stories told in Africa, or so I’m told; even more than what I’m told what Peter Brook would tell us, somebody sits in front of the fire or a ritual happens and it happens in front of everybody and it happens right there and they tell you what they’re going to do. They illustrate, ‘then he did this’ and then they do it. I am always the actor at all times, even when I am inside the character I am still just the actor inside of the character doing the play from their point of view. Your work draws on elements, icons and stories from the Yoruba cosmology, explain how that manifests itself in your work? Cosmology just means like world view, that’s all that really means. For instance the ancient Greeks believed in gods and goddesses that was their cosmology; their world view was that their gods created them. Inside every cosmology, of every culture there are arch types. There might be a god of war and the god of war for the Yoruba is Shango, for the Greeks it was Ares, for the Norse it was Thor and you see the interconnectedness of those. For me one of the reasons why I use the Yoruba was because the retentions of it are still in African-American culture and when I say retentions I mean like the way in which we practice church, our music has a lot of African rhythms in it, the way [he kisses his teeth] has translated. It’s incredible because people don’t think about it, but the fact that no one had to tell us, there is no television show in Africa and America that told us we still kiss our teeth, but we still do it. For that to still exist for this long means there is something powerful, strong and more importantly, strong enough to last historically. All playwrights do that, especially Shakespeare; Shakespeare relies heavily on Greek and Roman and all classical imagery is found in Shakespeare. From Homer and the Iliad to Norse and English satire and poems and folk law [to] Christianity and the entire Bible is in Shakespeare; all of the images from Christianity and Judaism. It’s much better to recognise them because once your recognise that there is no new story you then bring yourself to it fully, because you are no longer trying to create something new; which is what God does and if you try to do that you’d spend the rest of your life trying to kill yourself. Your work also has Biblical and Christian references in it, is that another one of your influences? Yeah, yeah, yeah totally – I grew up Baptist. Most of western allegory are found in those two places [The Bible and The cannon of Shakespeare], most metaphors and icons are found in those two pieces of literature. And for me…there is incredible beauty to The Bible, there’s incredible feats that happen, and again because The Bible is holy there are stories, images, icons, messages that are [pause for thought] iconic. That is true; there are tons of layers that I build up. Not because I want audiences to keep on coming back, [smiles] it’s less about the audience’s coming back to see the play but more so about finding as many entry points for as many audience members as possible. There are people who come and say ‘oh they’re talking that black slang; I don’t want to listen’, but then they’ll [the actors] say something that’s black slang but poetic at the same time and then they go ‘oh…huh’ it makes them have to stay for a moment. A friend and I talk often about diversifying the theatre audience and I don’t mean taking the people that were there away from the theatre but widening the audience of theatre. Because one gets kind of annoyed seeing the same kind of person in the theatre. Not because I don’t like those people, but what it tells me by seeing those types of people in the theatre is that the theatre, it reads to someone who does know, that the theatre is only for those people who are going. You can blast a television show into every house around the world pretty much, but you can’t do that with theatre, they have to come to you. So when they come to you, how open do you make the play so that they can be a part of it? How much do you say, ‘yes you belong here’ and that this is a conversation – not a monologue. But a dialogue between the audience and the play and you need to be here in order for this play to exist. Just as the actors have to be there; if one or the other isn’t there it doesn’t exist, it doesn’t happen….and that has always been important to me, to preserve that opening to preserve that back and forth. 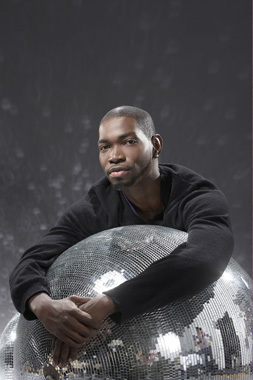 Tarell Alvin McCraney’s Wig Out is at the Royal Court Theatre until 10 January 2009.